Setup an OpenVPN site-to-site remote router (OpenVPN client) on Ubuntu Server 14.04 LTS – Life in apps, os's and code! In my last couple of blog posts (here and here) I demonstrated how to setup an OpenVPN server using Windows Server 2012 R2 and enable IP forwarding to enable OpenVPN client roaming access to the server network; today I will explain how to setup a Ubuntu Server 14.04 LTS based server which we will ultimately use as a site-site client router. To give you some background of what I’m doing, I’m going to use my existing OpenVPN server setup as per my last couple of posts (here and here) but I now want to setup a Raspberry Pi2 (running Ubuntu Server 14.04 LTS) as a router given that it consumes a low amount of power and small in size. The plan is to set this up at my mums house so that when it’s connected she can access my home network and vice-versa (a site-to-site VPN) this will enable her to then access my file servers, store all her photos and ensure that they are aways backed up to the cloud (my home file storage server runs FreeNAS using the ZFS file system and automatically backs up to a cloud storage service daily). A couple of considerations here, firstly my mum’s home router is a BT HomeHub and not something you can set static routes on (these kind of features normally only come with commercial grade routers), therefore I will instead install a DHCP server on the Raspberry Pi2 in addition to the OpenVPN client to enable the publishing of static routes to the clients on her local network, the set-up will ensure that only local network traffic bound for the server network is routed via. the Raspberry Pi2 (over the VPN) and local internet browsing traffic continues to route through the BT HomeHub (the default gateway) to maintain a fast web browsing experience! So first of all, I will make the assumption that you already have a clean version of Ubuntu Server 14.04 installed on your Pi2 (or other hardware). Next you should give some thought to your IP addresses that you will use, for the new remote network I will be using 10.10.0.x subnet you can ofcourse use whatever you like and I would recommend that you adjust any references to this subnet below if you choose to use a different one. So, for clarity, 10.10.0.1 will be the static IP address that be assigned to the BT HomeHub router at my mums house, 10.10.0.2 will be the static IP address that will be assigned to the Ubuntu Server that will be running the OpenVPN client, the DHCP server and will provide the routing for our VPN LAN’s. We will keep 10.10.0.3 – 10.10.0.9 free for any static IP address requirements and will configure the DHCP server running on the Ubuntu Server to distribute a scope of 10.10.0.10 – 10.10.0.50 to internal clients. Next you will need to restart the network interfaces (or simply reboot the server) for the changes to take affect. You can accept the defaults when asked for the Country, Org unit etc. but ensure that when prompted for the Common Name and Name attributes that these match your hostname (eg. ovpn-router-aaa) and ensure that when prompted for a challenge password you skip it!! If you would like to re-cap the process of creating the client certificates, see my original post here. Once you have created the client certificates you now need to locate the following files in the C:\Program Files\OpenVPN\easy-rsa\keys directory and keep them for later (we will need to upload these to our Ubuntu Server later! Any error messages should be visible here but you should be all good! Assuming all went well you should now be getting a response back from the server! Install a DHCP server and advertise the static routes to our LAN clients. So at this point we have our router connecting to our remote network and we have tested that we can route to the server using the 10.8.0.x subnet but now we need our local client machines (those machines on the client network) to know how to route traffic to the remote (server-side) LAN – In my situation this will be my home network! So simply replace the line INTERFACES=”” with INTERFACES=”eth0″ and then save the file! # Put all the static routes for your other networks here!! # If you have a server running NTP, you can set it here! Lets create the ‘ccd‘ directory now, this should be created under C:\Program Files\OpenVPN\config – Do this now! Next up, we have to create new configuration file in the new ccd directory (C:\Program Files\OpenVPN\config\ccd), this file should be named the same as the hostname/cert common name – Therefore in my scenario, the file should be name ‘ovpn-router-aaa‘ and you MUST ensure that the file DOES NOT have a file extention eg. if you are using for example, Microsoft Notepad, this will automatically add this for you, make sure you remove it if required! In the file we have to specify the internal route (using the iroute directive) this will force the remote LAN router (in our case, this will be the Ubuntu Router that will be located at my mums house) NOT to route the local LAN traffic over the VPN! # Set the internal IP range for this network. Save the file and restart the OpenVPN service using the Administrative Tools > Services panel. Given that we have just restarted the OpenVPN service you should force all your clients/other VPN routers to reconnect to ensure they get the latest configuration! # Save the current IP tables configuration so it is persistent. I would suggest rebooting your Ubuntu Server at this point!! Adding the new route to the DHCP server on the server network. We will now RDP to our Windows Server (the one that is running the OpenVPN server) and we will now add the new static route to our DHCP configuration. 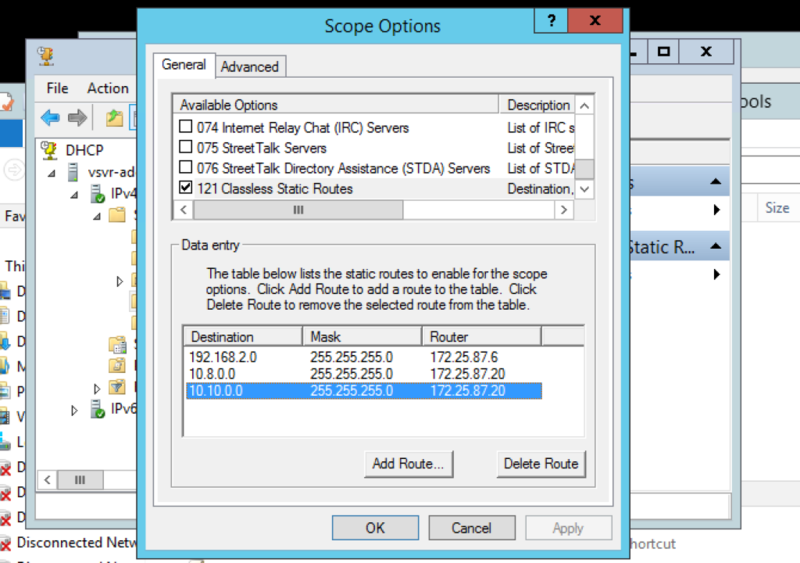 Ensuring that the router address is your Windows Server’s physical NIC address. Congratulations – You should now be all up and working!! If you have any servers with manually entered static IP addresses (not distributed by DHCP) these will need the static routes added manually if you wish to have them accessible to the other subnets. Enabling OpenVPN clients to access to the LAN.